The species of Auricularia, commonly known as wood ear mushroom, are morphologically and, above all, texturally quite distinct from other mushrooms. With typical ear like morphology with cartilaginous texture and gelatinous surface, these are liked as well as disliked at the same time by different people. This mushroom is very popular in China and Southeast Asia but does not seem to attract western consumers. It has been reported to possess many medicinal attributes: treatment of piles, sore throat, anemia and hypocholesterolemic effect (Quimio et al. 1990; Royse 1997). Out of about 10 recognized species of Auricularia two main commercially cultivated species are A. auricula and A. polytricha, the former is thin and light coloured while the latter is the thicker, longer, hairy, and darker. A. fuscosuccinea is also produced on a limited scale. Thailand and Taiwan are the main producers of this mushroom. 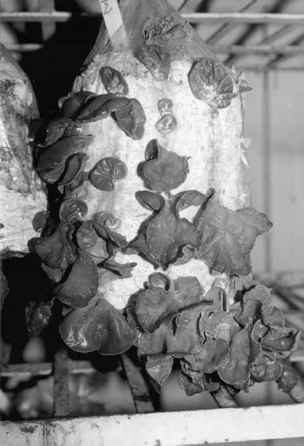 Like shiitake (L. edodes), Auricularia are also produced on natural logs as well as on synthetic logs (sawdust medium), the latter is more popular, productive and profitable system. The cultivation of Auricularia on natural logs is popular in the areas where suitable trees are abundant. 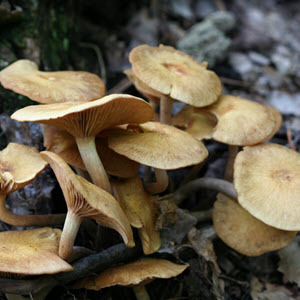 This mushroom, unlike Lentinula, is not fastidious about the type of tree species and almost any tree except pines can be used. A log diameter of 3-6 cm and length of 1 m is recommended. The time of season for log felling is similar to that for Lentinula log cultivation i.e., when leaves are just starting to dry in autumn then logs have sufficient sugar and moisture to support mycelial growth. Holes are made, spawned, and sealed like that for Lentinula and incubated (20-28°C) outdoors in the "laying yard" during which logs are turned upside down once a month. After about 2 months, logs are transferred to the cropping area which may be an open area in a forest or a green house or shed where logs are kept upright and frequently watered; ideal temperature for cropping is 15-25°C which of course depends upon the strain used. Mushrooms can be harvested about 30 days after exposure to cropping conditions. During the winters, production ceases but logs are kept protected for getting fruiting next spring by resuming heavy watering. The logs should continue to produce mushrooms year after year unless they become heavily contaminated with some wood decaying fungi. In the synthetic log cultivation, the substrate consists of sawdust, cottonseed hulls, bran, and other cereal grains. The substrate may be composted for up to 5 days or used directly after mixing. Compost is prepared by mixing and watering the ingredients (sawdust 78%, bran 20%; CaCO3, 1%, sucrose 1%) in a large pile, which is turned twice at 2 days interval. Directly used substrate mainly has 93% cotton seed hulls, 5% wheat bran, and 1% each of sucrose and CaCO3 which is moistened to a level of 60% and then filled into polypropylene bags and sterilized at 121°C for 60 min. Spawning is done in cooled substrate either with grain or sawdust spawn, manually or mechanically. Bags are incubated at 25 ± 2°C for 28-30 days for spawn-run preferably in dark area (<500 lux). Temperature is then lowered to 20 ± 2°C and light intensity increased to 2000lux to promote pinning for which 5-8 holes of 2.5 cm are cut in the bags for emergence and maturation of mushrooms. Biological efficiency of 100% and above has been achieved. In India this mushroom has been successfully cultivated on wheat straw supplemented with wheat bran (Figure 6) and B. E. of as high as 140% has been recorded (Bhandal and Mehta 1989). Figure 6 Auricularia polytricha on wheat straw blocks (mark the slits).